Author: Daniel Brown is a Lecturer at the University of Central Lancashire. SECCHI is part of NASA’s STEREO. The Heliospheric Imagers (HI) are part of the SECCHI instrument package  on the STEREO mission . Each STEREO spacecraft has two HIs: HI-1 views a 20° by 20° field of view and points away from the Sun by somewhere between 4° and 24°; HI-2 views a 70° by 70° field of view and points between 18° and 89° degrees away from the Sun. The HIs are normally aligned so that they observe along the ecliptic plane – the plane in which the planets move. Figure 1: HI-1A image with (left) the F-corona dominating the emission, and (right) with the F-corona removed to reveal a CME. The small bright objects in each image are the planets Venus (left-most) and Mercury (right-most). In these images, the Sun is to the right, but out of view. The aim of the Heliospheric Imagers is to observe coronal mass ejections (CMEs) from the Sun to the Earth . However, a typical HI image is dominated by solar light scattered off interplanetary dust, known as the Fraunhofer corona (F-corona), as in Figure 1 left panel. This emission must be removed to study CMEs. One possible method of doing this is to use a difference imaging approach (in which one image is aligned with and subtracted from the next image) as the F-corona can be considered static in comparison to CME eruption. This will reveal what is changing, and what is not changing – the ‘background’. The unchanging background includes the F-corona, and can be used to investigate the F-corona’s properties. The dust of the F-corona is thought to be in a cloud which is axisymmetric (symmetric under rotation about some axis) though not spherically symmetric , and at a large-scale (i.e., the scale at which the HIs observe), fairly steady – so observations over a long period can be used to build up a reasonable three-dimensional picture. We assume that the strongest emission comes from solar light scattered by features/dust/etc lying on a sphere with the Sun on one side, and the observer (i.e., STEREO) directly opposite, so that the sphere has a diameter equal to the distance between the Sun and the observer (Figure 2) . This is often called the Thomson sphere due to Thomson scattering of light off of electrons which has a 90° preferential alignment. 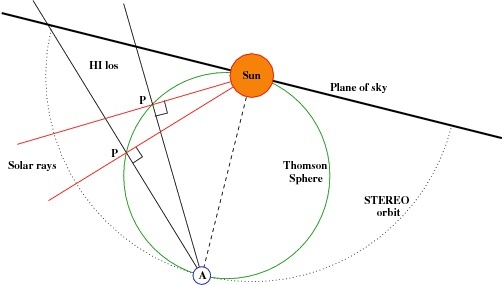 Figure 2: The Thomson sphere arises due to 90° preferential scattering of solar light off of electrons. It also coincides with the point of closest approach to the Sun of a particular line-of-sight from the observer. While Thomson scattering is not the dominant process here, the intensity of the F-corona along a given line-of-sight from the observer is strongest where that line-of-sight intersects the Thomson sphere. This marks the point of closest approach of the line-of-sight to the Sun, and the F-corona is denser and the intensity of solar light is stronger nearer to the Sun. This allows us to map the distribution of intensity, and hence scattering particles, onto the sphere. Figure 3: A HI image can be mapped on to the Thomson sphere, which is a good approximation to the location of maximum emission along any given line-of-sight. The orange dot represents the Sun, and the blue dot the observer (STEREO). 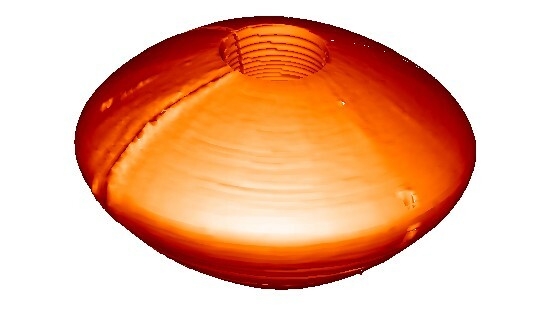 A STEREO/HI image mapped onto the Thomson sphere gives a three-dimensional indication of the scattering, and hence density, at that location (Figure 3). As STEREO orbits the Sun, the Thompson sphere moves with the spacecraft to create a series of slices of the intensity, and hence density of scattering particles (if we assume that the large-scale structure of the F-corona is suitably steady over the course of the observations). Stacked next to one another, these slices form part of a torus (doughnut shape), showing the 3-D dust distribution. Note, some image processing over short image sequences is required to remove transient emission, such as CMEs, and stars. Figure 4: Isosurface of the three-dimensional distribution of the F-corona scattering from HI-1A built up over just under 1 years of observations. Note, the rough break at the front-left of the isosurface is due to the Milky Way passing through the HI-1A field of view. 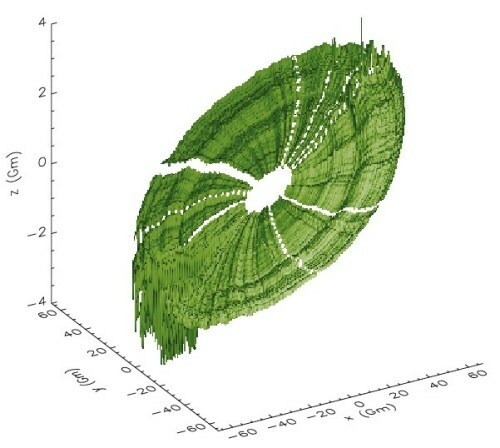 An isosurface from a three dimensional map of scattering from the F-corona as seen by HI-1A built up using just under 1 year of observations can be seen in Figure 4. While there are some wrinkles in the isosurface due to larger features passing through the HI-1A field of view (the Milky Way for example), the image does suggest that the scattering from the F-corona, and so the structure of the F-corona, is very axisymmetric. Figure 5: A longitudinal slice from the three-dimensional scattering map showing how the intensity falls off with radius, and that there is a latitudinal dependence to the scattering. A slice can be taken from the three-dimensional map showing how the scattering varies with radius and latitude (e.g., Figure 5). The intensity decreases with radius because of the declining intensity of solar light and interplanetary dust density as distance from the Sun increases. There is also latitudinal variation, which confirms a non-spherical density distribution of the F-corona. The intensity is higher nearer the ecliptic plane (zero latitude). However, closer analysis of Figure 5 shows that the peak intensity is not to be found at zero-degrees latitude, i.e. the ecliptic plane. For every radius and longitude, the latitude of the peak intensity can be found and used to produce a map showing the ’tilt’ of the F-corona compared to the ecliptic plane (see Figure 6). This map shows that the F-corona is inclined to the ecliptic by around 2.7°, which is comparable to a previous measurement of 2.5±0.5°  who used V and B filter, ground-based observations from a 16mm fish-eye lens attached to a CCD to study the F-corona. Observations provided by the STEREO Heliospheric Imagers have proved to be more versatile than just observing CMEs. This nugget has used HI data to investigate the three-dimensional structure of the F-corona, indicating that the large-scale structure is indeed axisymmetric, but not spherically symmetric due to latitudinal variation. 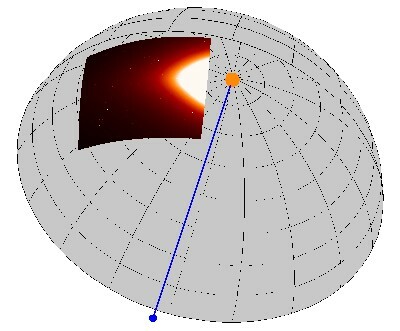 Analysis of the latitudinal location of peak intensity demonstrates that the F-corona is inclined to the ecliptic plane by 2.7° which is in agreement with the measurement of 2.5±0.5° by James et al (1997) . However, understanding why the distribution of the scattering particles is not concentrated around the ecliptic plane – the configuration with the lowest gravitational energy – is another question! Eyles, C.J., Harrison, R.A., Davis, C.J., et al, 2009, Solar Physics, 254, p387. Howard, R.A., Moses, J.D., Vourlidas, A., et al, 2008, Space Science Review, 136, p67. Kaiser, M.L., 2005, Advances in Space Research, 36, p1483. Davis, C.J., and Harrison, R.A., 2005, Advances in Space Research, 36, p1524. Koutchmy, S., and Lamy, P.L., 1985, Proceedings of the 85th IAU Colloquium, 9-12 July 1984, Marseille, France, p63. Vourlidas, A., and Howard, R., 2006, Astrophysical Journal, 642, p1216. James, J.F., Mukai, T., Watanabe, T., Ishiguro, M., and Nakamura, R., 1997, Mon. Not. R. Astron Soc, 288, p1022.